Marcus Maddison on the ball for Posh against Portsmouth. Photo: David Lowndes. Assist king Marcus Maddison created both goals as Peterborough United secured a valuable 2-1 League One win over Portsmouth at the ABAX Stadium tonight (November 21). Jack Marriott slid home from six yards to convert Maddison’s fine left wing cross in the 58th minute and 12 minutes later a wicked free kick from the Posh star was headed into his own net by Pompey defender Matt Clarke. Gwion Edwards surges forward for Posh in their 2-1 win over Portsmouth. Photo: David Lowndes. Pompey pulled a goal back 12 minutes from time, but never threatened to equalise. Posh sensibly recalled Gwion Edwards to the starting line-up in the one change to the team that flopped against Blackpool and he came closest to scoring in a low key half played at a painfully slow tempo. A fine passing move in 17th minute finished with Danny Lloyd slipping Edwards through on goal, but his chipped finish struck the crossbar. Lloyd was again the creator 10 minutes later when a quick break ended with Maddison smashing a shot at goal which last season’s Posh ‘keeper Luke McGee saved at his near post. Posh striker Jack Marriott challenges for a cross in the game against Portsmouth. Photo: David Lowndes. Pompey, who were without leading scorer Brett Pitman, were happy to sit back and wait for Posh passing errors. Despite the occasional dash forward by Jamal Lowe they threatened rarely with a well struck shot from Curtis Main smacking against the outside of the post just past the half hour proving to be their best effort of the first half. Posh manager Grant McCann tried to generate some improvement at the interval by switching to a flat back four from his more familiar starting formation with Ryan Tafazolli replaced by Andrew Hughes who went to a left-back role. Posh were now in midfield diamond formation, but the visitors looked more dangerous initially with Naismith forcing a fine save from Conor O’Malley with a 25 yard strike. Jamal Lowe then dribbled into the Posh penalty area before missing his kick when in a great position to equalise, but as just as the home side rocked they broke away to take the lead. Michael Doughty’s pass to Maddison down the left wing in the 58th minute was excellent, but not as good as the cross that followed and Marriott did the easy part from six yards to bag his 13th goal of a fine season. That was the start of a decent spell from Posh. A good low cross from Edwards and a good deep one from Da Silva Lopes were both well defended at the far post before Steven Taylor volleyed a Maddison corner over the bar. And a second goal wasn’t long in coming. Former Posh defender Christian Burgess delivered a cynical trip on Maddison which earned a caution and a free kick. Naturally Maddison took it and whipped in a delicious cross that Clarke unfortunately headed into his own net on 70 minutes. Pompey substitute Conor Chaplin missed an immediate chance to reply when left all alone in the Posh area from a free kick. He mishit his shot, but the ball still looped over O’Malley, slowly enough for Anthony Grant to head off the line. But Chaplin did better 12 minutes from time when Posh inexplicably allowed Danny Rose to waltz into the area. His shot was well saved by O’Malley but fell kindly for Chaplin who couldn’t miss from close range. But Posh saw the remainder of the game out rather comfortably. 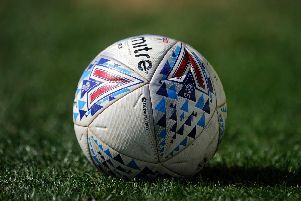 Striker Ricky Miller was a surprise inclusion on the Posh substitutes’ bench less than 24 hours before a court appearance.